We are pleased to announce that the Konfidio team will attend this years Ethereum Developer Conference in Cancun, Mexico. We are looking forward to provide our ecosystem partners with the latest updates on the future development of the Ethereum Network, Blockchain Scalability & many more interesting topics regarding the decentralized future. 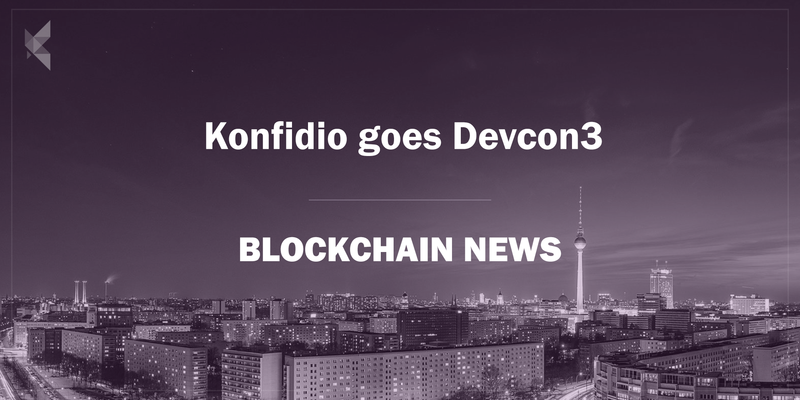 The Konfidio team will write extensive reports on the impact the discussed topics will have on todays economy and to what extent Ethereum can be used to create more efficient, transparent and secure businesses in the near future. If you would like to receive our reports from the conference, please send a mail to talktous@konfid.io. What is the Ethereum Devcon3? At Konfidio we are building an exponential future while solving current business challenges together with our clients and an extensive network of ecosystem partners. We combine the benefits of Blockchain, AI & IoT to create powerful applications, incubate promising startups and co-create ventures with our ecosystem partners and corporate clients. If you are also participating in this years devcon3, make sure to send us a quick Email to talktous@konfid.io to arrange a meeting prior to the event.